reprinted from ASPCA. make a note of this vital informaiton and keep it on hand if you are a dog owner. 1. Over-the-counter medications were the most common group of toxicants pets ingested in 2018, making up 19.6% of APCC’s calls. Ibuprofen, naproxen, cold medications and herbal supplements are all within this category. Make sure to keep all medications out of paws’ reach and check with a veterinarian before giving any new medication (prescription or not) to your pet. 2. Human prescription medications dropped to number two this year making up 17.5% of APCC cases. ADHD medications, antidepressants and heart medications were mostly commonly seen with these cases and calls. Most of these exposures are unintentional, but it helps to always keep medications far out of paws’ reach. 3. Food comes in at number three, with 11.4% of APCC cases involving food or ingredients such as xylitol, grapes, raisins, onions and garlic. 4. Chocolate has moved up another spot from last year, accounting for 10.1% of APCC cases. That’s almost 60 cases a day! Keep candy and baked goods away from your pets because they have no qualms about gobbling it all down. 5. Veterinary products accounted for 9.3% of cases in 2018. Like most poisoning situations, these are accidental or unintentional exposures. Many pet medications are flavored to increase palatability, but some mischievous pets may mistake these for treats and overindulge. Remember that a “childproof container” does not mean pet-proof! 6. Household items remain at number six this year, accounting for 7.3% of last year’s cases. Household items including paint, glue and cleaning products—though not necessarily a tasty group of toxins–are often easily accessible and in close proximity to our furry friends. 7. Rodenticide exposure increased last year to 6.3% of APCC’s caseload. Always remember that pets, along with rodents, find baits very tasty. Rat or mouse bait ingestion can be deadly for our pets so it’s best to always be mindful if you have these products around. 8. Insecticide exposure cases decreased again this year and accounted for 6.2% of cases. Insecticides include items such as ant baits, bug sprays and yard products. Make sure to read all labels and keep your pets out of the affected area when using any of these products. 9. Plants remained in ninth place this year, accounting for 5.5% of cases. Indoor and outdoor plants, as well as bouquets, can all be sources of potential problems for pets. 10. Garden products came in at number 10 again this year, accounting for 2.3% of APCC cases. Many pets find fertilizers irresistible, making ingestion more likely. Make sure your pets aren’t “helping” when you are out working on the lawn or in the garden with herbicides and soil enhancements. 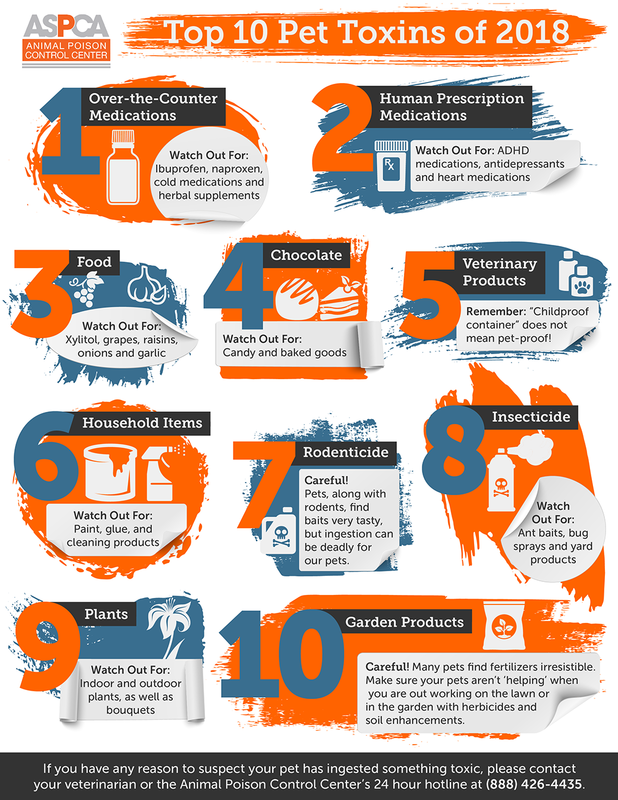 With any potential dangers and toxins, it is important to keep these things out of paws’ reach. While accidents can always happen, the less accessible any of the items are, the less likely your pet is to get into them. To help you stay up-to-date on potential pet toxins or dangers, download the APCC Mobile App today! If you have any reason to suspect your pet has ingested something toxic, please contact your veterinarian or the Animal Poison Control Center’s 24 hour hotline at (888) 426-4435. Earthquake in Central Italy levels mountain town. All that’s left is their iconic recipe.